Well, I am still not running. I had an MRI on Friday, so hopefully I'll hear soon about what's going on and when I can run again. I sure miss it!! I started my new job this week. So far it's just been a lot of reading materials and watching videos from the 90's. I can't wait to actually start working. I am loving being with adults again! 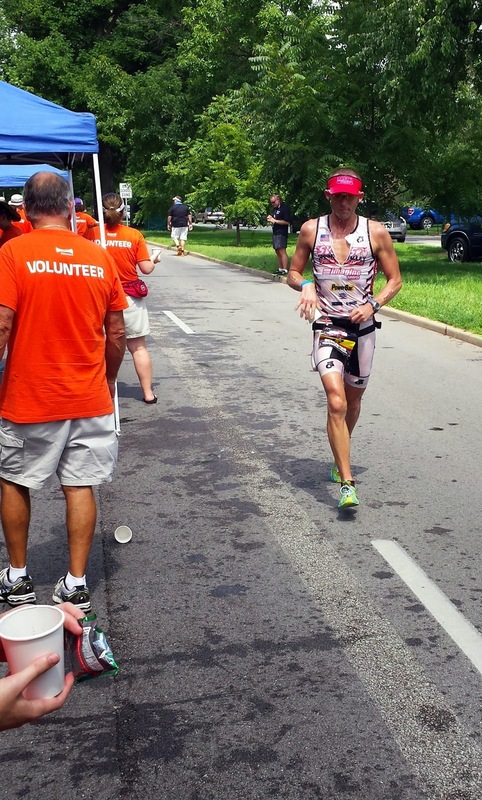 Sunday I volunteered at Ironman Louisville. It was an awesome experience! My job was handing out coke. I probably said "COKE" a few thousand times! I also got quite a few coke baths! eating the potato chips and pretzels as he was handing them out! Now, let me tell you, it was HOT. The heat index was in the 100's, and it was humid. Every single runner was soaking wet. I felt like I was melting, just standing there. I can't even imagine swimming, biking and running in that! They are incredible athletes. I knew after volunteering, I would want to become an Ironman. And I do. What stops me is the amount of training that goes into it. I don't know how people have the time! I guess you just have to have a very understanding spouse/family who is ok with not seeing you for a very long time. Since I don't have my own children, that would make it a little easier for me too. What also stops me is the $650 fee!! Really?? Really. If you ever have a chance to volunteer at something like this- DO IT. Just knowing you played a small part in helping or encouraging someone to cross that finish line, is an amazing feeling. Would you ever do an Ironman? Do you like volunteering for events? 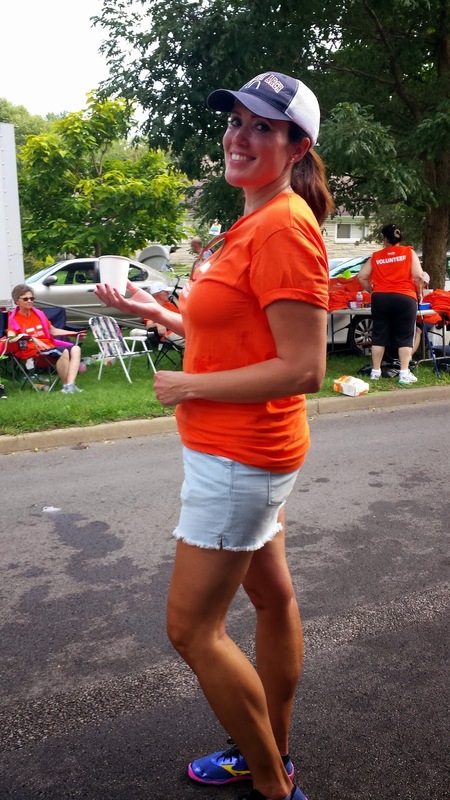 For the last 2 years I've volunteered for my local marathon, the Fox Valley marathon and I LOVE it. We spend all summer planning, and it's amazing seeing the race come to fruition! I've never thought about doing an Iron man...I am just not that uber, LOL! Hope you are able to run again soon! Wow, that's awesome that you do that! Thanks MIchelle! Fingers crossed for good news from the MRI. I love volunteering at events like that! The price is a major factor in stopping my IM career. The entry fees are enormous not to mention all the gear and training! Bucket list item for me too! $650??? Yikes! I'd like to do a sprint tri, but the swimming holds me back. I can swim to play around, but I've never learned proper strokes to really get me traveling with any speed. I hope the MRI reveals nothing problematic! The swim is actually the only part that would scare me. Running and biking I can do. Thanks Jennifer! I think it is awesome you did this! An Ironman is also on my bucket list, but yes its going to have to wait until I have enough time to train properly for it! I've got a few friends who do them and say its like marathon training in the as far as the tie requirements. But it would be awesome to try at least once! I haven't ever volunteered at a race, another thing I need to do! That's so cool that you got to put together a race! I'm sure they were very glad for your help, even though you couldn't stay! $650?! holy macaroni. no thank you! i couldnt do a triathlon, let alone a ironman. jeepers! i am definitely interested in volunteering now, maybe next year! i hope all good news from the MRI! I know it!! I can't figure out why they have to charge that much! Thanks girl. Ironman is totally on my bucket list! :) I want to do one after I'm done having kids and breastfeeding! It takes A LOT of time to train, and I just cannot do that yet! I've heard the time it takes is ridiculous. But definitely worth it, I'm sure! The entry fee is CRAZYYYYYY!!!!!! I'd put that money on a Disney race :) But I would love to have Ironman on my bucket list. Side Note - your text came through to me last night about 10:00 saying you were done... I hate my phone. I hear ya, I could run 5 marathons with that money! I hate that I didn't get to see you, I just figured you were too busy. Triathlons are terribly expensive! I get that they have to block off a lot of roads and there's a lot of liability involved, but $650 is a lot of money, especially on top of all of the money you have to spend on a fancy bike. I'll stick to just running. :) Hope you got a good shower in after the Coke baths--that sounds terribly sticky and uncomfortable! I am shocked at how expensive they are! That just does not seem right. Yes, the shower afterwards was wonderful! Triathlons are crazy expensive compared to running, but they're SO worth it. I absolutely suggest trying a sprint at a more reasonable entry fee...once you see what all the hype is about you'll gladly hand over however much money they want ;) It's so cool that you got to do this! I watch Kona on TV every year and just that is so inspiring I need a box of tissues. I can't imagine what it would be like to be in the midst of an Ironman, watching all those athletes. I'm unsure if I'll ever do an Ironman, and if I do it won't be for a long time, but I really want to do it, just for the experience.